USA – Pagami Creek - It will be one year ago tomorrow that lightning ignited one of Minnesota's largest wildfires. The Pagami Creek Fire covered 93,000 acres in the Boundary Waters Canoe Area Wildness. Now, scientists are finding a goldmine of clues to the region's past unearthed by the fire. "This is what folks used to make stone tools out of in what's now known as the boundary waters." Johnson, and his team are finding stone tools that could be nine-thousand years old from the Palo Indian Era. "It's easy to see things like lithic artifacts, debitage for making stone tools, pottery and other artifacts that can tell us something about the folks that were living here before the Boundary Waters was designated." These stone tools are leftover from some of the first inhabitants of the Northland; people who lived in the region after glaciers receded more than 10,000 years ago. "It's interesting because you see that landscape similar to what it was like after the glaciers receded; really open landscape and you can image what it looked like as a tundra," said Johnson. ROYAUME UNI – Morpeth – More evidence of the lives of Morpeth’s Newminster monks has been unearthed. Members of Coquetdale Community Archaeology (CCA) found traces of a medieval mill connected to the Morpeth abbey when they were digging at Barrowburn, on the River Coquet, last year. 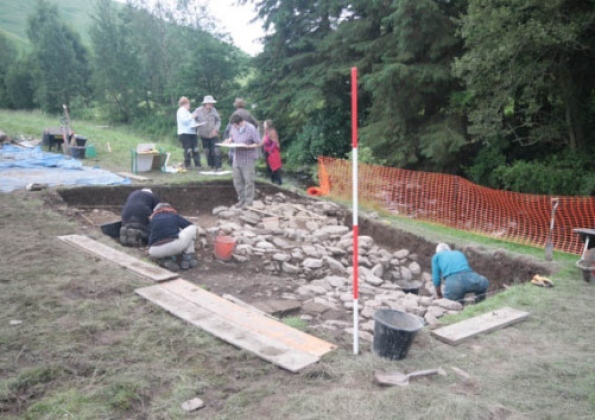 A wheel pit, constructed from high-quality masonry, was found in the river so this year the team returned to see what else they could discover. A large trench uncovered a cobbled area some way from the river’s edge, which was initially thought to be the remains of an old road. However, after careful work with trowels, two 13th Century coins were found, one a silver penny from the reign of Edward I, dated to around 1280, which indicated that the surface was contemporary with the mill. It is now thought that the cobbles could have formed a yard on a terrace. Pieces of medieval pottery were found and nearer the river the soil was increasingly impregnated with charcoal. Eventually, the probable source was identified when a very dense area, about a metre down, was discovered, near where the wheel shaft would have entered the building. 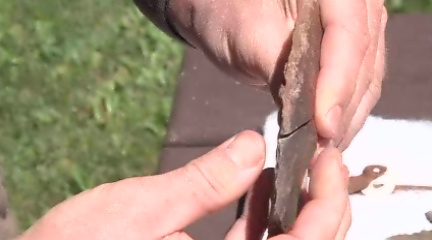 On the final day of digging, pieces of heavily-corroded metal, a large nail and badly decomposed wood were found. Conditions were difficult as the soil was waterlogged and had to be constantly drained with a sponge so a decision was made to stop work, protect the area, and make a plan to return at a later date. In the meantime, experts will examine the charcoal to see if it can be carbon dated and find out whether it is linked to the demise of the mill. Richard Carlton, of the Archaeological Practice that directed the dig, said: “This could be a highly significant find. “No medieval mill of this sort has ever been excavated in the north of England and evidence about how they were constructed would be very significant. PAKISTAN – Hund - The provincial archaeology and museums directorate has found remains of houses, coins and household articles of Hindu Shahi dynasty in Hund area of Swabi district during the latest excavation. 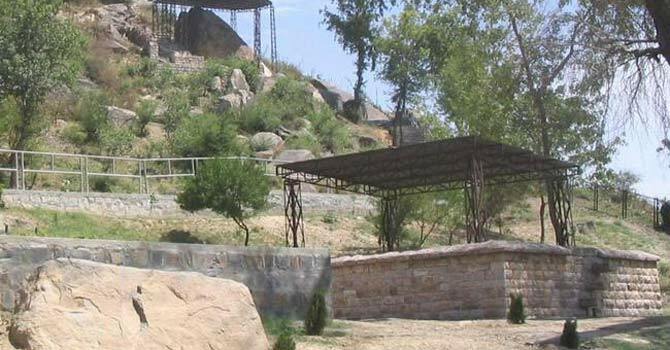 Asif Raza, in charge of Hund Museum, told Dawn on Friday that excavation in Hund, one of Khyber Pakhtunkhwa’s major archaeological sites, began in June 1996 after inauguration by archaeologist late Dr AH Dani and then provincial culture secretary Arshad Sami Khan. He said Hund city was developed on the bank of the River Indus and washed away by flooding. “The actual name of Hund is Udabhandapura. Alexander came here in 327BC. He crossed the River Indus in Hund when one of his generals prepared a boat bridge. “Famous Chinese pilgrim Hiuen Tsang passed through this area in 644AD. After Peshawar and Charsadda, it was the third capital of the Hindu Shahi dynasty,” he said. Mr Raza said beautiful houses, coins, jewellery and other household articles of the Indo-Greek and Hindu Shahi eras had been found during excavation. “We’ve also discovered parts of the city’s boundary walls,” he said. The in charge of the museum said buildings of Kushana, Hindu Shahi and Islamic eras were found during excavations. “The houses and other building of Kushanas and Hindu Shahi periods showed the marvel engineering know-how of the people of ancient times. They had beautiful rooms and halls, rows of pillars, steps, floors levels and ovens. The places where they existed had gorgeous gateways and planned streets,” he said. Mr Raza said drainage system found in Hund turned out to be the most developed of that time. “We’ve found such a drainage system at places excavated so far in the world,” he said. INDE – Maski - Archaeologists found some skeletons in a graveyard in Maski village of Raichur district on Friday. 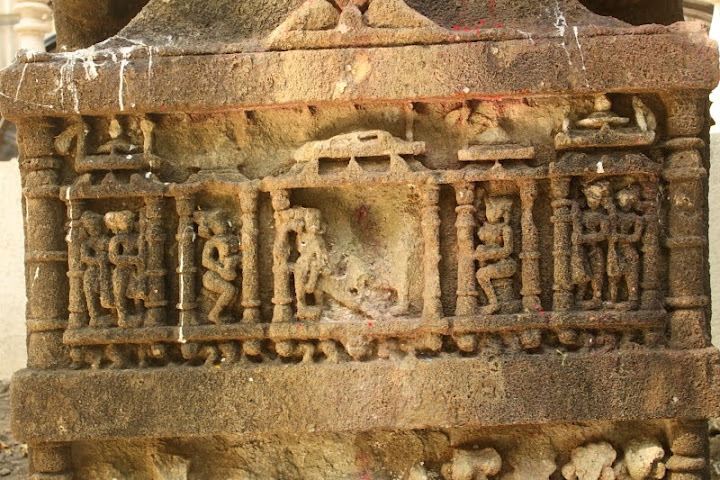 Maski is well-known for stone inscriptions of King Ashoka. Around 4-5 skeletons were found in a pot. The graveyard is behind the stone inscription of Ashoka beside Maski hills and is a prohibited area. Speaking to TOI, Raichur Superintendent of Police S B Bisanalli said that the skeletons may have been placed in the pots following some rituals. The Indian archaeology department will study the bones, he added. INDE – Eksar - Where would one typically expect to find 800-year-old stone carvings that provide perhaps the only proof of an ancient civilisation's naval prowess? Certainly not in the corner of a dusty construction site, exposed to the elements and unrecognised by any heritage conservation bodies. This, however, has been the fate of a set of at least five 12th-century hero stones in Eksar, a rapidly urbanising fishing village in Borivli (West). The Eksar hero stones or war memorials are flat basalt tablets, between four and eight feet high, with intricately carved panels depicting ships and sailors – something rarely seen on hero stones, which usually depict land battles. "The Eksar stones are the only ones in Mahara-shtra that indicate that the 12th-century Shilahara dynasty had a navy and fought a sea battle," says Arvind Jamkhedkar, former director of the state government's archaeology department. TURQUIE / ARMENIE - Ani Ruins - Excavation and conservation works continue at the Ani Ruins, which lie just outside the city of Kars between the Turkish and Armenian border, after a two year hiatus. Excavation works first began in the Ani Ruins in 1909 and were resumed a few decades later in 1946, according to Culture and Tourism Provincial Director Hakan Doğanay. “No excavations were carried out in the region in 2010 and 2011,” Doğanay said, adding that five restoration projects have been completed at the ruins so far since 2009. “We regard the Ani Ruins as ‘a living city with seven layers.’ Excavation works should be conducted systematically to bring these seven layers to the light. We initiated these systematic excavations this year and they will continue in 2013 to reveal the historical heritage,” Doğanay said. The Ani Ruins draw great attention from tourists, said Doğanay, who said increased interest in the ruins would revive the city of Kars. “This historical site in Kars province will get the value it deserves. So far tombs, skeletons and broken pots have been recorded in an inventory. The items found during the excavations are first cleaned and then exhibited at museums. But we unfortunately lack an excavation house. If we had one the works would progress more rapidly,” said Doğanay. ROYAUME UNI – Bromyard - Archaeologists believe they have found the remains of a medieval village in Herefordshire. Excavation work began a week ago on land in the Brockhampton Estate, near Bromyard and experts say it gives a glimpse of rural 13th Century life. They believe the remains, on the estate that is managed by the National Trust, includes part of a building that may have been a manor house. It may be part of a village called Studmarsh, on land known as the Grove.